During our 3+ year journey around the globe we try to experience new things and seek adventure outside our comfort zone. 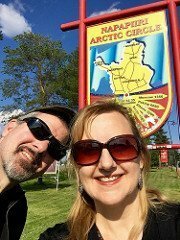 Earlier in the year we rode horses for the first time and later Larissa flew an aerobatic plane upside down in Las Vegas. 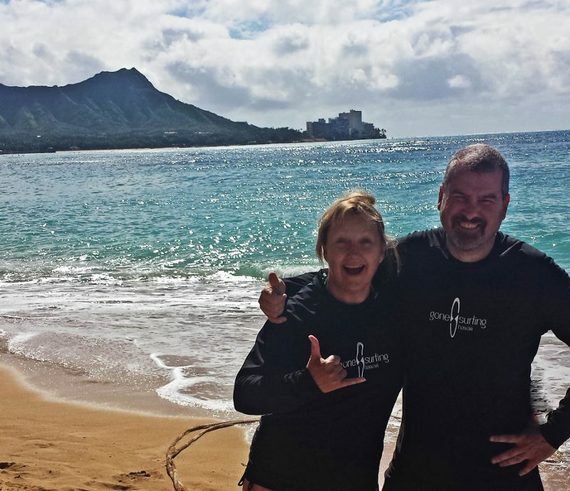 Which was how we found ourselves bobbing up and down on the gentle waves at Waikiki Beach in Hawaii. 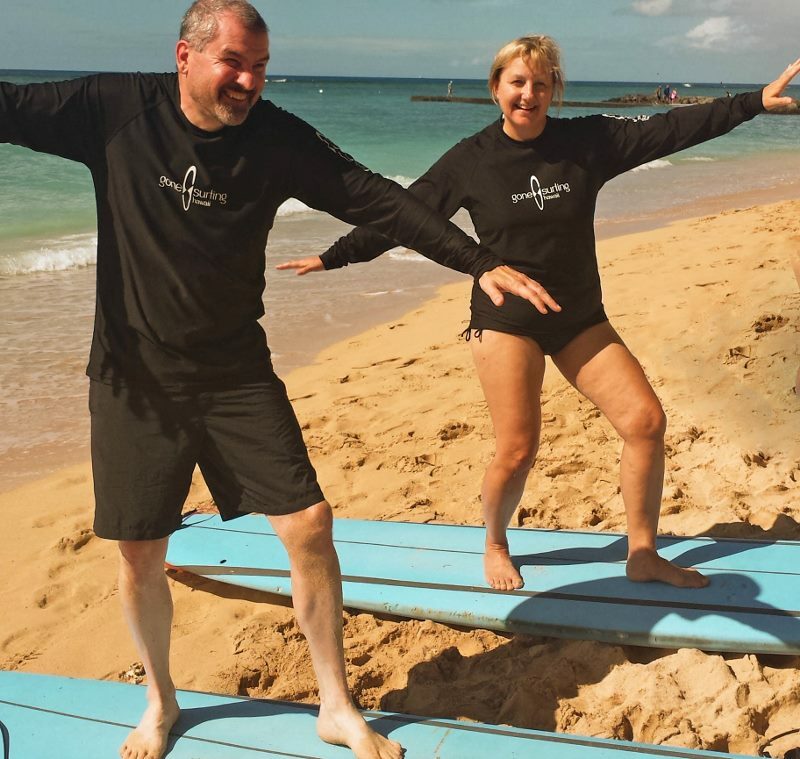 We were finally learning how to surf in our 50s. Waikiki Beach is an excellent spot for the beginner surfer: the waves break in easy 3-to-5-foot swells and there’s an abundance of surfing schools. We chose Gone Surfing, figuring that its female owner, Jo Jo Howard, would be patient with our nonexistent skills. We signed up for a two-hour semi-private lesson. Jo Jo was assigned to Larissa while Noah handled Michael, a formidable task for the young surfing instructor. We started with a quick safety lesson on the beach where we were taught what to do out on the water. The three-step process seemed simple on solid land: 1) Bring your knees up; 2) Set your feet; and 3) Stand up. What could go wrong? Since the waves on our part of the beach were pretty flat, Jo Jo and Noah towed us out to a farther section of the beach. Or we should say “toe’d.” Each of them hooked a toe over the front of our surfboard and paddled us out into the ocean. That was so relaxing that it could be a new activity for old-timers. As we bobbed around in the water waiting for a wave Michael tried the three-step process on the stationary surfboard. Guess what? It’s a lot easier on solid ground. With the water shifting underneath him he promptly did an ungainly face plant. Watching Michael’s belly flop brought images from the movie Orca to mind. Hmm, maybe this would be harder than we thought. The mellow Noah said not to worry. It would be easier when the board was moving. That sounded counterintuitive to Michael but getting into the Hawaiian island spirit he decided to roll with it. And then it happened. The first wave came. Michael was face down on his board and was paddling with the wave as it pushed him to shore. With Noah shouting out the commands Michael somehow found himself in a standing position on the board, feet pointing in the right direction, arms stretched out for balance. It must have been a day for miracles because he was actually surfing. His five second ride felt like five minutes and when he came crashing into the water at the end he was stoked. Larissa jumped onto the second wave and with her convenient lower center of gravity (okay, she’s short) also rode to a watery glory. We were thrilled. One of the nice things about surfing is that even experienced surfers end their rides with a dive into the water. It’s basically how you stop so when we fell off the board at the end of our attempts it wasn’t the same as doing a face plant on a ski run. It was actually quite refreshing. We wore long-sleeved black shirts called rash guards that protect the skin from sun and scrapes. One of the nice things they do for a middle-aged surfer is act as a cover-up for sagging muscles so we looked as sleek as champion Laird Hamilton, well almost. We might just start wearing them everywhere even when we’re not hanging ten. We were warned by some friends that we’d be pretty sore afterwards. The next day we were a bit sore in our ribcages where they pressed into the board. But that was it. A day after that we were fine. The one lesson has given us enough confidence that if we’re staying someplace where we can rent boards we can now do so. 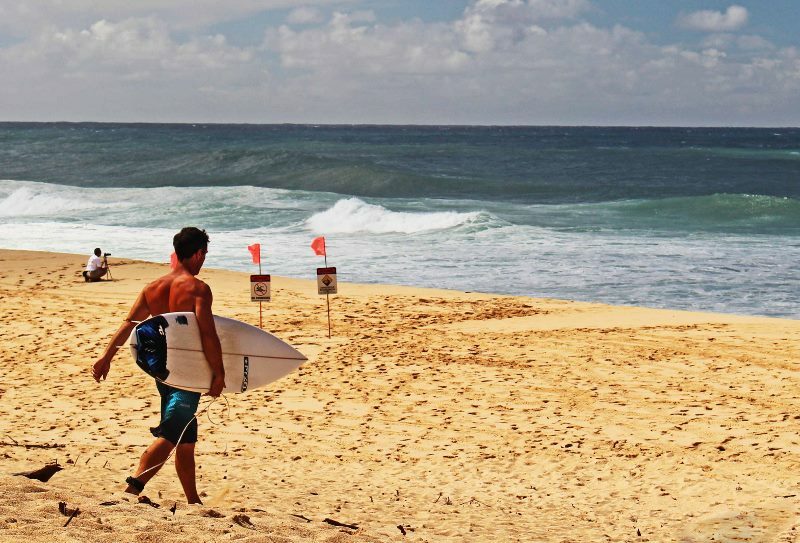 Granted we’re not ready for the Banzai Pipeline on the north shore of Oahu, but we feel we can handle something more modest without embarrassing ourselves. Collecting experiences at this point in our lives feels so right. We are creating new memories and are even picking up a few new skills along the way. Besides, as nomads without a home we can’t collect stuff, we have no place to put it. 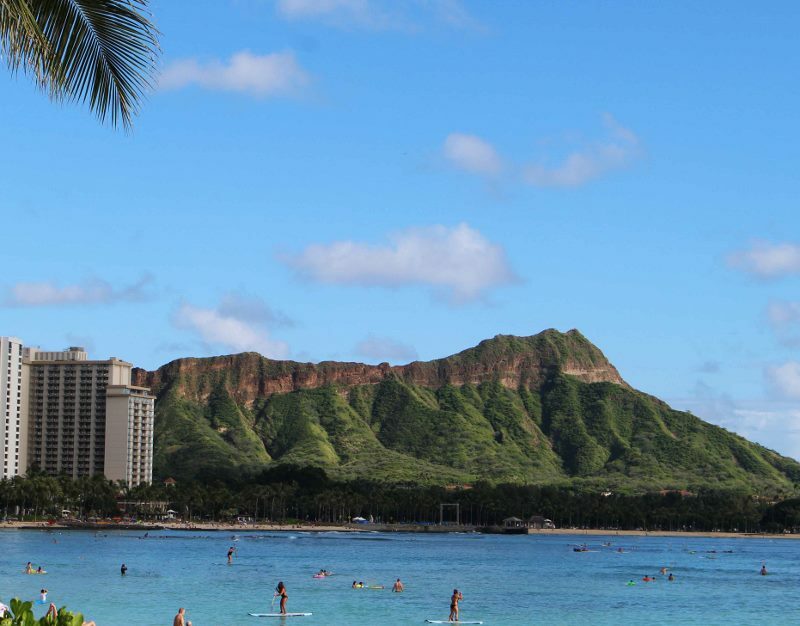 Hawaii Vacations: Save 30% or more in paradise! Here’s how to connect with Gone Surfing who was kind enough to provide us with this lesson. Larissa and Michael are your typical middle-aged couple from Philadelphia who’ve been traveling the world full-time since 2011, seeking off-beat, historic and tasty sights. To receive monthly updates and valuable travel tips subscribe here.